Genuine British Army Issue 'Pack Air Support'. This is essentially an outsized Infantry Bergen with multiple improvements. Approximately 20% larger than the original Infantry model these have become popular purchase items for forward operating troops. Standard Temperate DPM Cordura body with either OG or black mesh padded back for comfort, ventilation and swift drying. Lightweight internal frame with 5 'legs' rather than the usual 3. Shoulder straps and waist belt are wider than the Infantry design. 6 utility sized pouches fitted to the front, all with snow/sand locks, drainage eyelets and adjustable strap and QR buckle closures. Top row are UK Water Bottle size, lower row are slightly larger than the issue utility pouch. Larger size will accommodate a single UK 24 hour ORP, or issue Gore Tex suit. Zips for PLCE Side pockets on both sides and on the lid. Side pockets are not included. Lid is considerably larger than than the Infantry model and features a larger external box pocket plus the usual internal pocket. 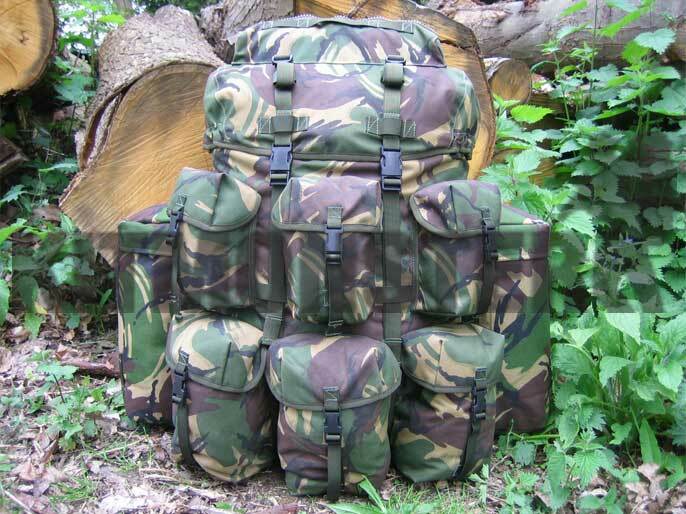 Length adjustable cargo straps on the lid front with Velcro tidy loops for excess strapping. The lid is also fitted with zips for the PLCE bergen or Medical side pockets (not included). Label reads 'Field Pack Air Support Back, DPM, IRR'. Very limited stock, new, unissued condition. Neither side pockets nor pack contents are included.